“This is already a victory for progress in Compton. We led the way with 3,248 votes or 47 percent of votes cast in Tuesday’s election. Compton voters made it clear that they want to move forward and not backward and on June 6 we're sure that message will hold true. “Throughout this campaign, we witnessed the love that Compton residents have for their city and the interest they have in our shared vision for Compton’s future. Working families across Compton rallied around our message 'Let's Finish the Work' and demonstrated their desire to stay the course, as we continue to build a better Compton by empowering and restoring our community. Over the last several years, I’ve made it a priority to ensure new internal controls, improve our fiscal accountability and root out corruption and wasteful spending at every opportunity in an effort to be good custodians of our resident's tax dollars. I've also led the way with new economic development to strengthen our local economy through new investment and new jobs for Compton residents. “We're at an exciting time in Compton as we are prepare to roll out the largest street reconstruction project in our city's history. Thanks to Compton voters, we finally have the funds in place to reconstruct Compton streets and ensure that our investment is maintained for years to come. “I'm also preparing a city reform package for the voters to consider which will include modernizing city government and long-term property tax reform. Brown led the vote in both vote by mail and with voters at the polls. Citywide voter registration in Compton is 45,135. With all precincts reporting and vote-by-mail and provisional ballots counted, the overall voter turnout in Tuesday’s election was 6,977 or 15.4 percent. Because no candidate for mayor emerged with over 50 percent of votes cast on April 18, a runoff election will be held on Tuesday, June 6. 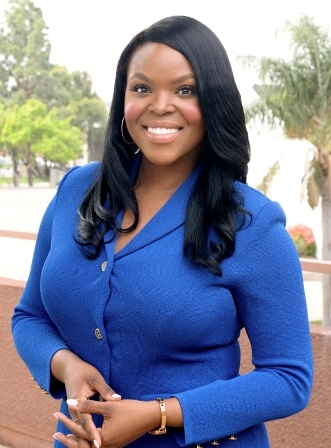 At 31, Aja L. Brown made history as Compton’s youngest elected Mayor in 2013. A national trailblazer, Mayor Brown’s New Vision for Compton platform is a revitalization strategy centered on 12-key principles that focus on family values, quality of life, economic development and infrastructural growth. For more information on Mayor Aja Brown’s campaign, visit ajabrown.com.